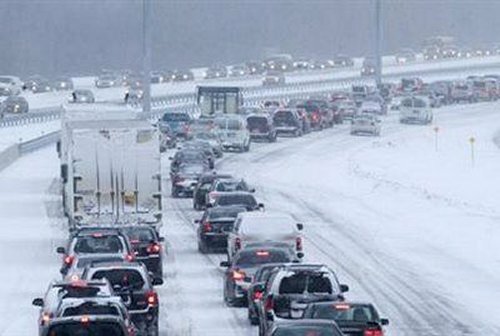 As we move through fall, it's getting closer to that time of year when Canadians and Americans begin thinking about the dreaded winter driving months. Sand bags are added to pickup truck beds, snow chains are put in the trunk, and weather forecasts are once again a part of our daily lives. With a little luck and a refresher course on winter driving, though, we'll get through it once again. For those who live where the seasons never change.. well, bite our collective butts. "Wait," you ask, "why are you qualified to talk about winter driving, Aaron?" Simple. I learned to drive in Utah, my birthday is in January (which tells you about when I took my first driver's test), and I drove a big rig over the road for three years covering just about the entire country and in all types of weather. Finally, I now live in Wyoming where 4-whee-drive and snow chains are standard equipment. The first rule of winter driving is: don't drive. If you don't actually need to be out in the bad weather driving, then don't go out. How badly do you need that soda or need that gallon of milk? Are you willing to face the blizzard for it? A lot of our reasons for going out can be postponed until the weather clears. First and foremost, your tires are the primary thing keeping your car on the road. Yes, that's obvious, but if you're using the factory-installed "low rolling resistance" (aka "eco") tires or if your tires are getting thin in the tread department, you'll want to consider swapping them. In areas with severe weather, it's not uncommon to have a "winter set" and a "summer set" of tires. If your car is new, it almost assuredly has low rolling resistance tires on it and those are like driving on ice skates in the ice and snow. They have very hard rubber and that means little grip. Sacrifice the fuel economy for safety and swap them for the winter. On the other hand, going overboard with winterizing your tires is also a bad idea. It's very rare that studded snow tires are actually needed. You do unneeded damage to your car and the roadways by using these tires all of the time. Instead, carry some "quick chains" or other grip-enhancers for when things get really hairy and otherwise drive on plain rubber. After a good snow or ice storm, especially in the morning before going to work, many drivers get lazy about clearing the snow from their vehicles. This is both dangerous and a good way to lose fuel economy. Snow piled onto a car lowers visibility for both you and the drivers around you. Snow covering your lights, mirrors, and packed into your fender wells is just as bad and can be a safety hazard to you and other motorists. In most states, having your license plate covered by snow is illegal as well. Taking the time to clean the ice and snow off your car can have other benefits. That stuff is heavy and the more of it you drive around with, the lower your fuel economy will be. For the average car or light truck, a hundred pounds of weight means a 1% or higher reduction in fuel economy. If you've shoveled snow, than you know that the amount that can be piled on top of your car can weigh a lot. If your vehicle is equipped with 4-wheel or all-wheel drive, that's often a bonus in bad weather. It is not, however, a guarantee. The most common mistake I've seen on winter roadways is by people driving SUVs or pickups with 4WD who seem to believe that having that four wheel drive means they can safely go faster. Traction is dependent on tires when at speed, not drive train. Braking is the same no matter what your car. Those larger 4WD vehicles also tend to have higher centers of gravity, which means they slide even more. Windshield wiper fluid is usually just water, food coloring, and possibly some detergent or mild soap. If you live where it's cold, then you've seen the "anti-freeze" wiper fluid being sold. This is an eco-friendly (usually alcohol-based) option you should definitely use. It keeps your wiper fluid from freezing, which could harm your reservoir, lines, or pump. Definitely worth the extra buck or so a gallon. It may not seem likely, but bridges, overpasses, valleys in the road, etc. all can freeze well before the roadway does. For bridges and overpasses, this has to do with the thermal properties of having air passing underneath as well as over the top of the road. Roads built on land tend to stay warmer because of the heat-trapping properties of the ground underneath them. Bridges and overpasses don't have this. So they freeze faster. Valleys, on the other hand, can be a place where moisture pools and cools faster than elsewhere. They also tend to have more (or less) air movement, resulting in colder temperatures in their micro-climate. Putting tire chains on after you're already stuck is pointless. And probably impossible. If you do get stuck, try "rocking" the vehicle by going forward and reverse to move it back and forth and try to break free. If your tires are just spinning, don't try moving at all as you'll only dig yourself in deeper. Try releasing the traction controls to see if that is hindering your tire grip. Unless you've gone well off the roadway, don't get out of your vehicle unless it's absolutely safe to do so. Not only is it colder outside (and you might be here a while, waiting on that tow truck), but you can be seriously injured or killed if another car loses it right where you did and comes barreling into you. Many drivers use the tire marks in front of them as a guide to stay on the road and if yours lead them off... well, they'll lead them right into you. Turn on your emergency lamps and contact someone to help you get free. In some areas where winter is common, police and fire may be allowed to assist you to get out. Otherwise, you'll have to wait for a very busy tow truck to come around. Last and definitely not least: take it easy. Being late to work isn't the end of the world. Drive slower, take your time, and be safe. Whatever your hurry.. it's not worth it. Slow down.